Can you please give users an option to always keep favorites on top? Are you running 1Password 7? There is a Favorites section in the sidebar that might be what you are looking for. Otherwise, in the Suggested Items section, favorited items should be sorted at the top of each subs section. Is this not what you are seeing? The favorites "section" is what I am referring to. I would like to keep this section on top. @GeorgeRudd - ah, thanks for that clarification/screenshot. The Favorites section IS at the top of that image...except for the saved sites that match the current page. That's not likely to change, as most people want the saved sites for the page they're on at the top, most-easily accessible. I would recommend using a site that you don't have quite so many saved logins/items for, if that's possible. 30 is indeed a lot...but again, most people have nowhere near 30 different logins for the same site. I'd like to +1 this feature request from @GeorgeRudd as I have the same issue. I have only 6 different Google account logins (some from shared family vaults), but two are favorited — my work and personal Google accounts, both of whose passwords I need to access several times a day. When I trigger 1Password Mini then search "goog", I will get the work favorite at top, then a few more rarely used items, then "Show more items…" My personal (favorited!) item is "below the fold", requiring me to click "Show more items…" to reveal. I would request that favorited items always appear at the top of the list, and always above "Show more items…". Thanks! It sounds like you're talking about the presentation in 1Password 6, which is at this point no longer receiving any further improvements. 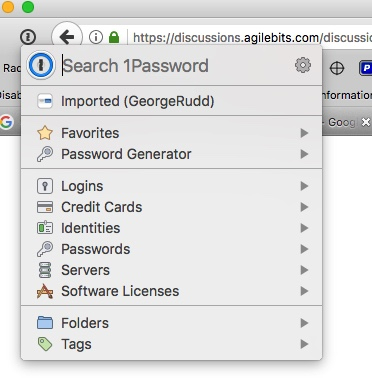 I think you might like what you see in 1Password 7's mini; "show more" is no longer part of the UI and favorites always bubble to the top of the list. I'd recommend trying out the beta version as it has a different mini from the current version 7 release as well.